I took a drive tonight to find a photo. In the skies overhead, lightning flashed sporadically and I considered abandoning my quest, however the warm air and the wind blowing into the car as I drove down dark roads convinced me to continue. I ended up in Shipshewana, Indiana once again – it seems to be my most frequent night-time destination – and walked around with camera and tripod. 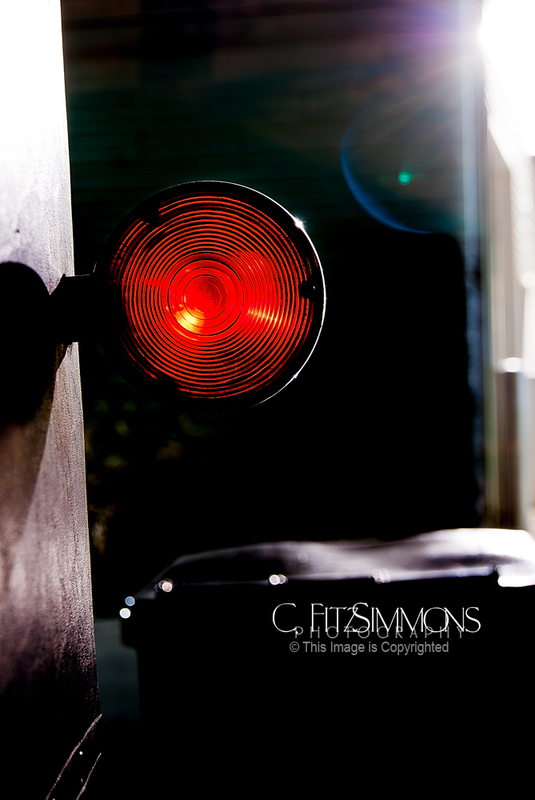 I found a window reflecting hundreds of lights, a clay pot with a long shadow and this, the red signal light on an Amish buggy parked on a side street. As I walked back to my car, a woman was leaving the back entrance of the Blue Gate and we greeted each other. She thought I was with another local photographer and was quite surprised to find that I was just taking a photo for today. Well, I don’t seem to know a stranger, so I stood in the warm air and had a lovely conversation with this woman, whose name I never learned, finding that I am “just like her cousin,” that her daughter goes against the normal flow by staying single and having a career, that her sons are extremely easy-going and that her co-worker grew up in the same geographical area I grew up in, among other things. She and I have mutual acquaintances and my husband’s family “has hung” with members of her family. It has been a long time since I have just stood in the warm evening air, chatting with a stranger for the sheer pleasure of the conversation. I need to do it more often.